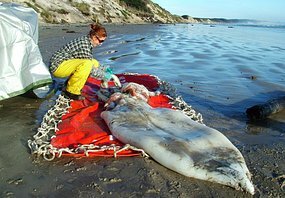 Zoologists say it remains a mystery how a 200-kilogram giant squid came to be washed up on Tasmania's west coast. The squid was found by a member of the public on a beach. Zoologists from the Tasmanian Museum and Art Gallery say the squid's hood and body is more than three metres long and they estimate its full size with tentacles would have been seven metres, with a weight of around 200kg.